Curves to Kill...: Chef Good - Simply, Easy and Yum! Chef Good - Simply, Easy and Yum! After a month of giving in to amazing food while travelling abroad, I really needed to get myself back into a healthy eating routine once I arrived home. We all get a little lazy or give in to fast and fatty foods while on holiday so now that I'm home, I've jumped back onto my favourite food delivery service and my week days are full of amazing food and flavours. This is my second round with Chef Good and you can hear all about my first time in previous posts. The reason I adore this diet plan so much is because of one major factor - it's a diet that feels nothing like a diet. I've tried everything in the past to lose a few kilos and I'm either starving all of the time or rather repulsed by the lack of flavour and frozen meals. But Chef Good takes all the calorie counting off your hands and delivers health, lean and amazing tasting meals to you fresh every week. Nothing is frozen, everything is prepared in house by amazing chefs and the taste is second to none! This round they have a brilliant new ordering system in place via the website and I really love how easy it is to cycle through and pick your meals and snacks for the week - yes snacks are included!! I'm absolutely crazy for fresh veg and dips and you can now have this option as as snack. The website is super easy to use and I'm loving the new iPhone view! 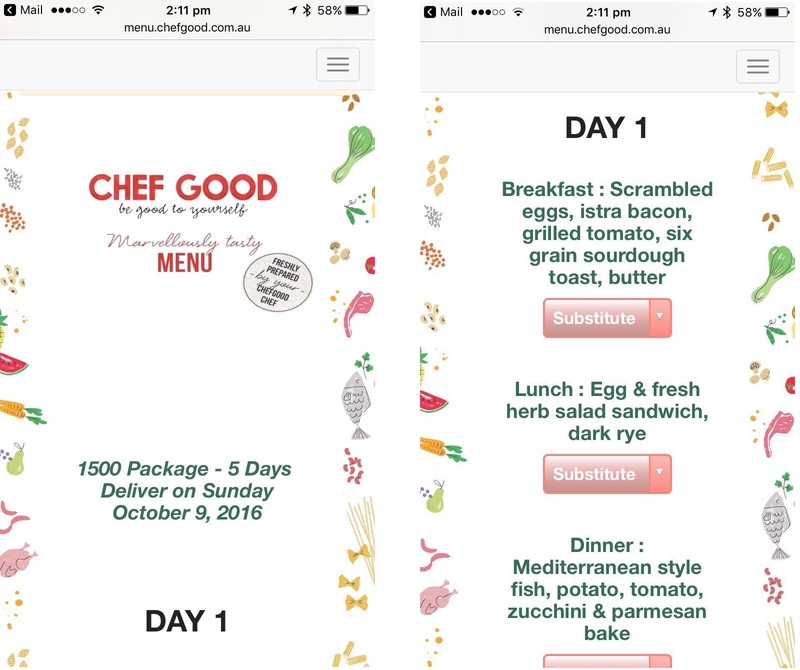 With an easy to use scroll menu you have the options of sticking with your selected diet as is or customizing each and every meal with a variety of different options via the drop down box. Each menu item is able to be changed and there are heaps of different options available. 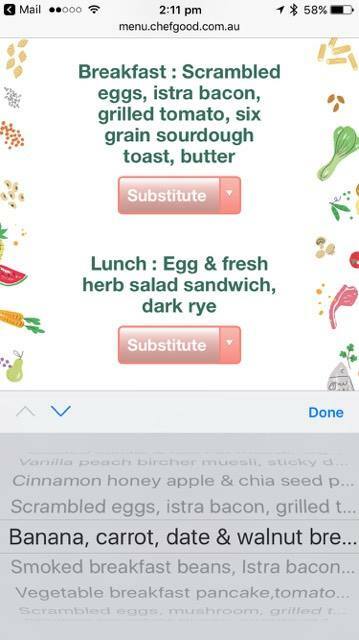 With all of these different substitute options available you'll never have to settle for something you don't like or a food item you may not eat. Plus just as of last week the Vegetarian menu has is now offered in 1500 and 1800 calorie packages. You can now order veggie options in snacks and meals be it a full week's worth or just a few added to your normal menu. I love both meat and fish based meals and vegetarian dishes so this gives me so many more options to choose from. The variety helps as I'm super picky and love all the options but dislike mushrooms, eggplant etc so the choice really does help me customize this perfectly! Here is a small selection of the amazing meals I've had over the last two weeks. These meals are so fresh and flavour packed you'll completely forget that you are on a diet! Another brilliant feature is the cooking aspect of this service! While some items are ready to be heated and eaten others take a short amount of cooking time and this is perfect for my husband and I. On our at home 'date nights' we love to cook and dieting can really get in the way of that. But with dishes like fresh chicken tacos and french roast chicken and veg I can still cook and eat with him! 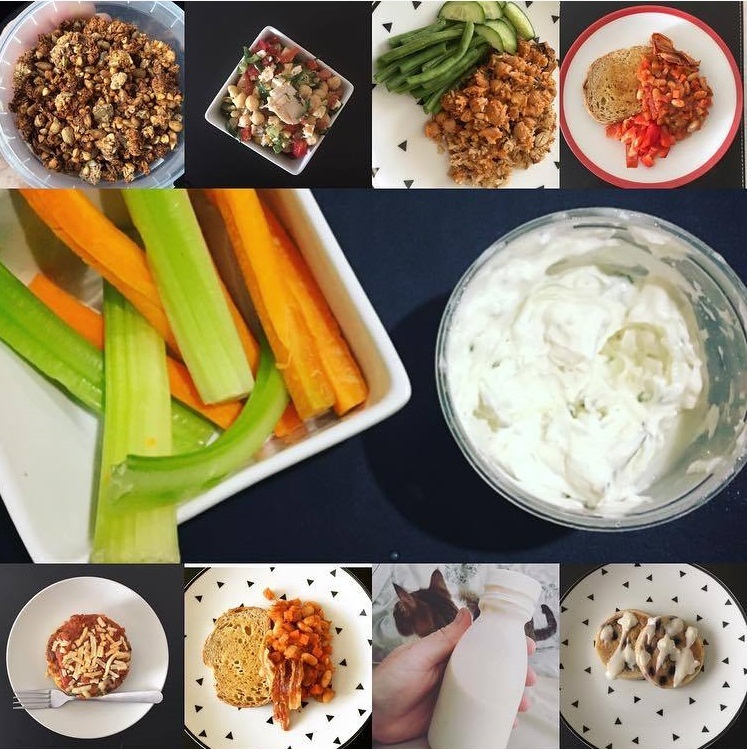 If you are looking for a time saving, great tasting and calorie controlled meal plan this is the one for you!! So be sure to pop on over to the website and see if they can deliver to your area.